I have been intrigued by the story of Uncle David Johnson since my father told it to me years ago. I always found it rather sad. I have done some digging in an attempt to get a better understanding of what really happened. Some families may be embarrassed by this kind of story and even refuse to discuss it. I find these kinds of things fascinating. They kind of bring out an inner detective in me. With many such stories, there is the family version and a somewhat different version given through records. Some of the family version is what my father has remembered, being just a child when all these things happened. 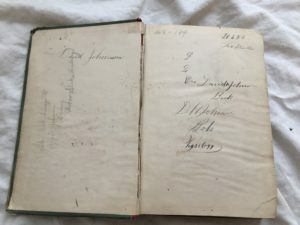 I have poured though David’s numerous petitions, trying to make sense of them. They have the outward appearance of formal legal documents, but they are rambling, disjointed, repetitive, and confusing. The ones I have copies of are dated 1958-1960, so were written long after the incidents. 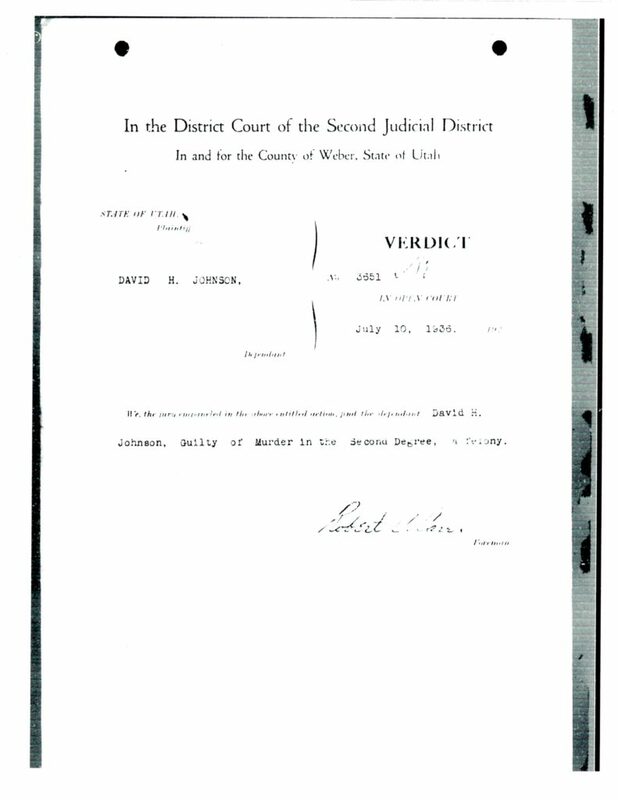 I searched legal records at the Utah State History office and found even more petitions among the court documents. Some of the newspaper articles I have read have obvious errors. I of course, have my own biases and perspective based on my experiences. I will try to present what I have learned and what conclusions I have made, as well as what questions I still have. The story my father told starts with David being a very successful farmer. The land west of Ogden was alkaline. David developed a drainage system which leeched the alkali from the soil. He raised very good crops there, much better than his neighbors, which raised suspicion and allegations that he was taking more than his share of water. The picture in my mind as I heard Dad’s story was of a wild west shootout with David in a ditch shooting to defend himself. David was shot in the head. The other guy was shot too – but he died. David was convicted of murder and served a life sentence in the Utah State Penitentiary. Through research I realized that this was just the final chapter of David’s story, which had many more interesting details. 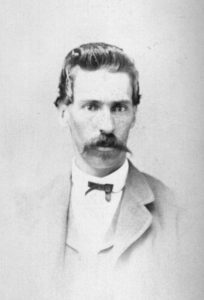 David Johnson homesteaded some land in Ogden Valley as a young man. He was married at age 25 in 1900, so may have already owned this land for a while before his marriage. He had a dispute there with some of the neighbors over water rights. He outlined this dispute in a document titled “Attachment to Brief on Appeal” apparently drafted as part of an appeal to this first conviction. David owned 160 acres located at the mouth of Wolf Creek Canyon in Eden. 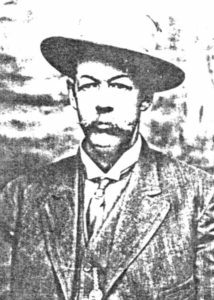 The officers of the Eden Irrigation Canal Company at that time were George Fuller, Ben Colvin and Virgil Stallings. David apparently had two shares and an allotted time to water his land, but one week when there had been rain, he diverted “surplus” water to a narrow strip of land, where it would run into the canal. David was accused of stealing the canal water, was found guilty by a Justice of the Peace and fined $1200.00. David appealed this decision to the District Court. 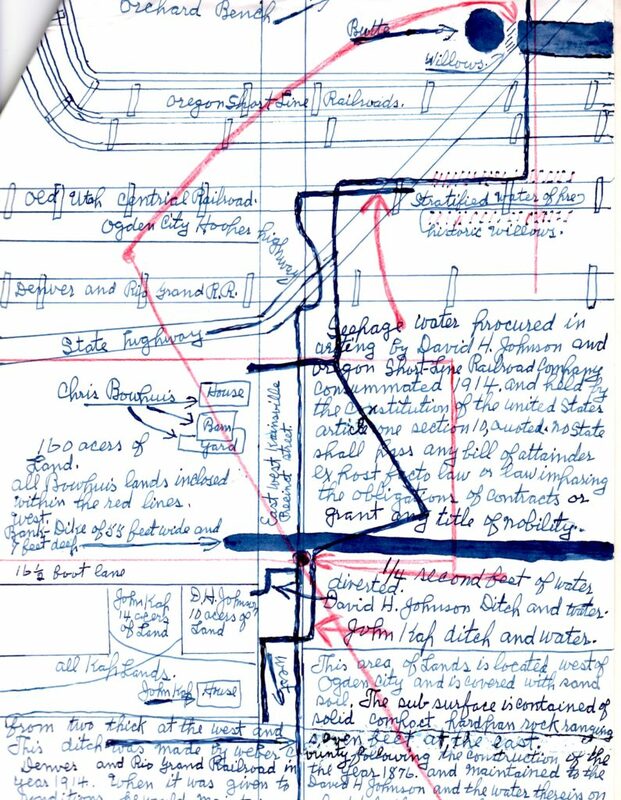 The details in David’s petition are rather confusing, but the sense I get is that he felt that the Canal trustees had resources and power and pressured him to abandon his land. He was rather young at this time, and according to my father, he agreed to sell rather than face legal consequences. 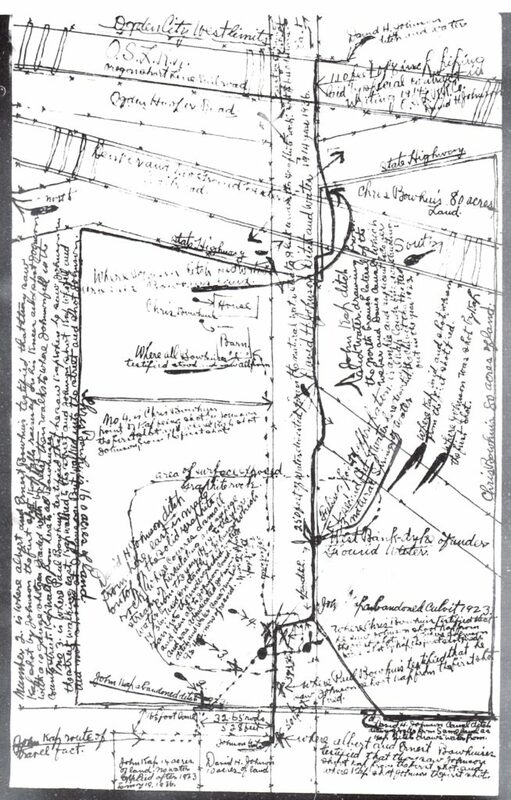 David sold this land in February 1904 to Anthon F. Anderson. After selling his land and leaving Eden in 1905, David lived in Ogden City for several years. He first lived on Jefferson Avenue and then later in West Ogden on E. Ave. 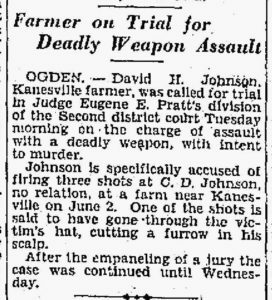 He bought a farm in Kanesville, in Weber County in 1914. On June 2, 1929 David had another dispute over a bill for pasturage. This one was with a neighbor named Carl D. Johnson (no relation). David fired three shots at this other Johnson, one going through his hat. Carl Johnson hit David and knocked him down with a shovel. David was charged with assault with a deadly weapon and intent to commit murder. 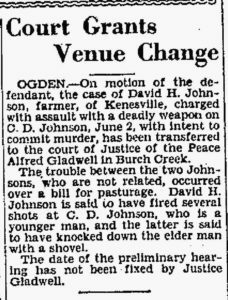 The case was transferred to the Court of Justice of the Peace Gladwell in Burch Creek (now South Ogden). Adjacent to David’s land in Kanesville was land owned by John Kap. David claimed he had been threatened by Kap and Kap’s brother-in-law Chris Bowhuis, “If you don’t leave this country at once and give us your land ditch and water in this street, we are going to kill you and bury you like a rat.” Apparently they had dug a “grave” already for him. David asserted that the State of Utah had denied all right held by David H. Johnson of land ditch and water as stood in this street. 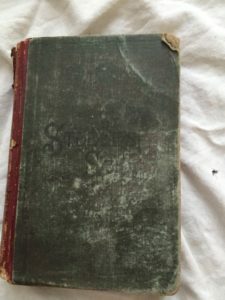 This had been acquired by Weber County on the construction of Utah Central Railroad in 1876, and when the road grade was built, it dug up the Salt Lake Valley hard pan rock, and stopped the flow of such under ground water coursing west to the lake. 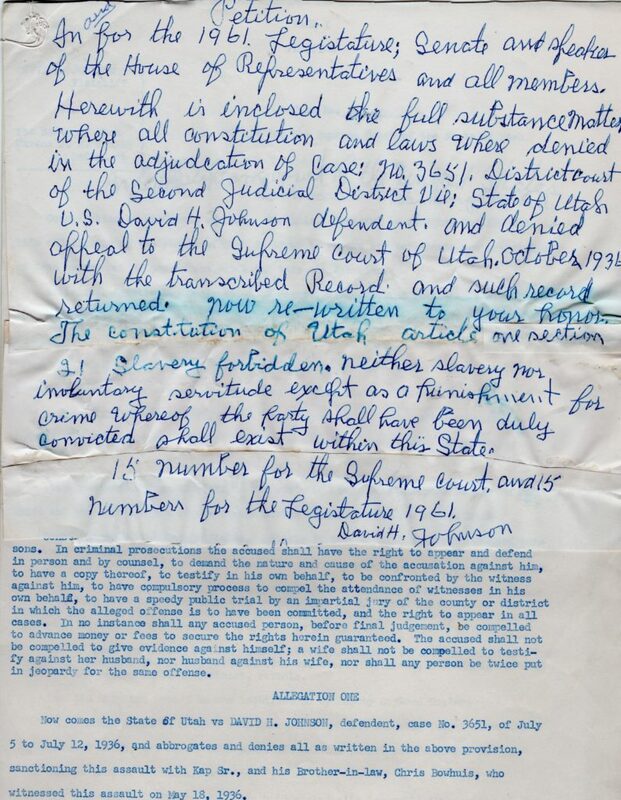 The State of Utah engineer, George M. Bason accorded this to David H. Johnson by State filing No. 9727 April 1925. This was proved up on and recorded January 1928. David Johnson used this for 11 years to May 19, 1936. John Kap died May 27, 1936. Apparently he was recovering from his wound, but later died of a lung hemorrhage. David was then charged with murder. The main witnesses at the trial were the family members of the victim and the police officer. I question whether David had very good legal counsel. David fell asleep at his preliminary hearing, and reportedly got angry at the Judge at times during the trial. The Judge also indicated that David had given varying details at times and he did not believe some of his claims. The letter that Judge Leslie Wade wrote to the Parole Board gives his summary of the charges and the trial with additional details. He explained the dispute about the water and a statement David made to the Watermaster that he would kill Kap if he attempted to take water from the ditch. At 6 pm on May 19, Kap went to the ditch armed with a shotgun and a shovel, and with his brother-in-law Chris Bowhuis on lookout for any trouble. David was there with a 22 rifle and a .38 caliber revolver. The judge described the incident as David firing first at Kap and then Kap rose up after falling to the ground and fired a shot at David which hit him in the head. Apparently there were more shots fired as Kap walked away. The Judge did give some indication that all sides were partly at fault in the ongoing water dispute. County Water Commissioners attempted to arbitrate the matter and there was previous court action. Interestingly the Judge stated that he had been involved as David’s attorney in a previous case and later withdrew, which raises some questions about his impartiality in this case. The Judge also reviewed the earlier 1929 case, disputes in 1931 and 1932 with Kap and Bowhuis, and other petty court actions. David must have gained some knowledge of the judicial system, some through experience, and likely through study in prison. He knew enough to create petitions, which contain some legal terminology, but are rather confusing and difficult to follow. He didn’t seem to understand appropriate procedures well. One petition with handwritten cover page over mimeograph copy. In the top right hand corner the pages are fastened together with thread sewn though. Some of the petitions included hand drawn maps. David’s case went before the Parole board a number of times and was denied each time. He was denied Parole in February 1940. 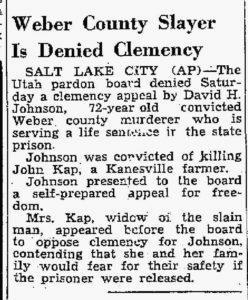 A self-prepared clemency appeal was denied by the Pardon board March 17, 1946. Mrs. Kap, the widow of John Kap appeared before the board and said that she would fear for her safety if David was released. 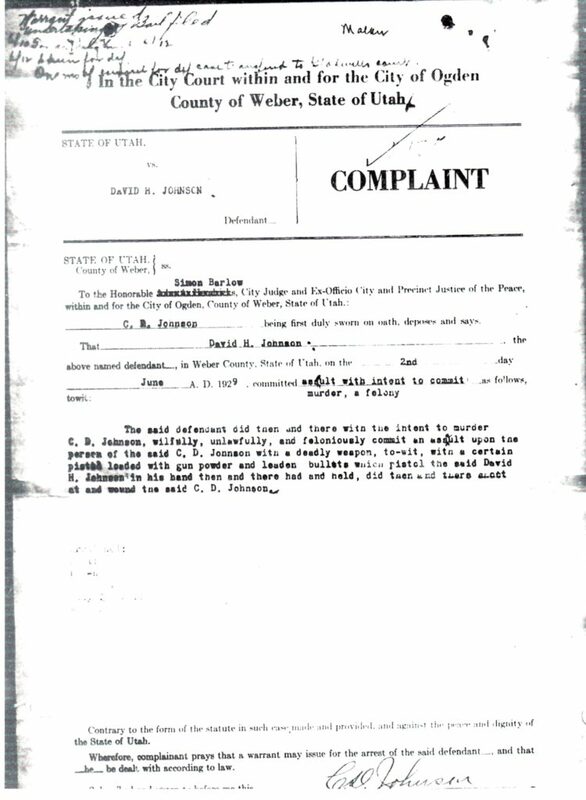 Dec 23, 1951, David made another appeal to the parole board, still saying he was innocent. It is interesting that the Prison Warden, John Turner, is quoted in this article after David’s death, saying that he was a model prisoner and caused no trouble there, yet the Judge had indicated in his letter to the Parole Board that if David’s attitude changed, parole might be appropriate. Warden Turner also said that to his knowledge David had never been up for parole or termination. “He may have had desires to get out but apparently didn’t push the matter”. I wonder how well this Warden actually knew David. It does appear that David spent the remainder of his life rather obsessed with trying to get out of prison. David did spend the remainder of his life in prison. He actually was taken to Salt Lake General Hospital and died there, rather than in the prison itself. Are we seeing a pattern here? A single incident might lead one to believe that David had indeed been ganged up on, provoked and taken advantage of. But there seem to be repeated conflicts with neighbors which escalated to the point of violence. David clearly had trouble getting along with neighbors and had a hot temper. I do believe that David felt that he was being threatened and needed to defend himself and his property. I think he truly felt he was the one being attacked and acted in self-defense. In the first incident in Eden, David was very young and up against the established leaders of the community. In the last incident, the “victim” Kap and neighbor Bouwhuis were relatives and had other family members taking their side. David’s property was very literally surrounded by the land of these two. But I have to wonder if some of this feeling like a victim of conspiracies was a bit of paranoia. The mention from the Prison Warden about David being sent to the State Mental Hospital and the institution in American Fork, may suggest that some thought that he suffered from some impairment or mental illness. Also there was mention of a potential insanity defense to the murder charge. Having some experience with traumatic brain injuries, it would make some sense to me that after the last incident where David was shot in the head, he may have had some impairment because of that. That might account for some things, like not being able to communicate coherently his account and falling asleep in court during his preliminary hearing. Though feelings of persecution and violent responses were evident much earlier. I still feel that Uncle David’s life was rather sad. 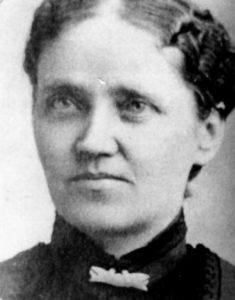 Annie Christine Johnson Eggleston was born November 7, 1864 in Salt Lake City, a daughter of Peter Johnson and Ane Maria Madsen. Her parents had immigrated from Denmark separately just a few years earlier. They married September 27, 1862 in Salt Lake City. Annie Christine was their second child and was born before they moved to Eden. She was known as Christine, probably because her mother was Ane Marie and her older sister Annie Marie. She grew up in Eden on the family farm. Her father died in 1878 when she was 14 years old. She probably helped to care for her seven younger siblings. 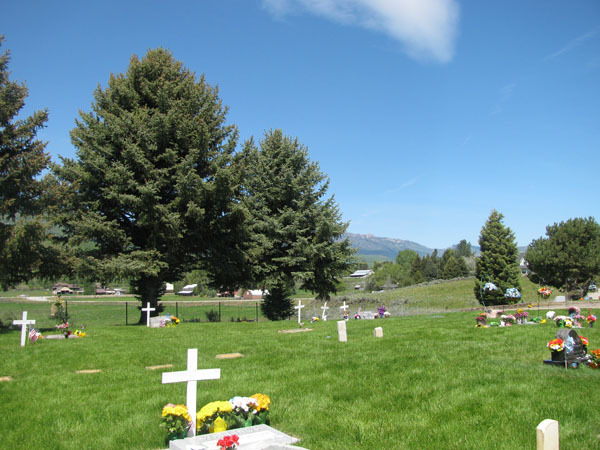 My childhood memories of Memorial Day include traditional visits to “the valley” – Ogden Valley. I remember some visits with Grandpa and Grandma Eggleston on their farm, then after Grandpa passed away we visited Grandma Stella. We would always visit this little Cemetery to put flowers on graves even when there were no living grandparents to visit. I first became aware of the existence of Mormon Row in 1996. 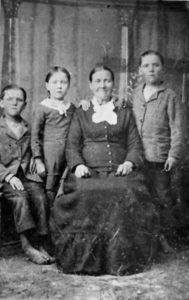 I had done genealogy research for some time and knew that Grandpa and Grandma Eggleston’s first four children were born in Grovont, Wyoming. I had no idea where Grovont was – I don’t think it is on any current maps – just somewhere in the Jackson Hole area. In 1996, my Dad was invited to a Mormon Row Centennial Celebration for descendants of the original homesteaders. The first homestead was granted in 1896. Eventually there were 21 homesteads there.